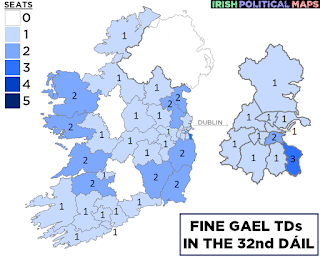 On 16 May 2017, the Taoiseach Enda Kenny put an end to speculation on his departure from office when he announced his resignation as leader of Fine Gael at midnight that night. 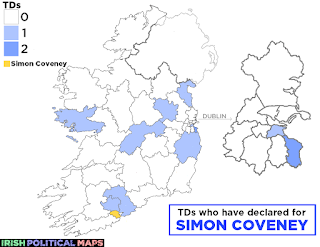 Attention quickly turned to the two men widely known to have aspirations to the top job: Social Protection Minister Leo Varadkar (Dublin West) and Housing Minister Simon Coveney (Cork South Central). While Varadkar was an early favourite to win, the speed at which he accumulated the support of the Fine Gael parliamentary party (TDs, Senators and MEPs) took many by surprise. 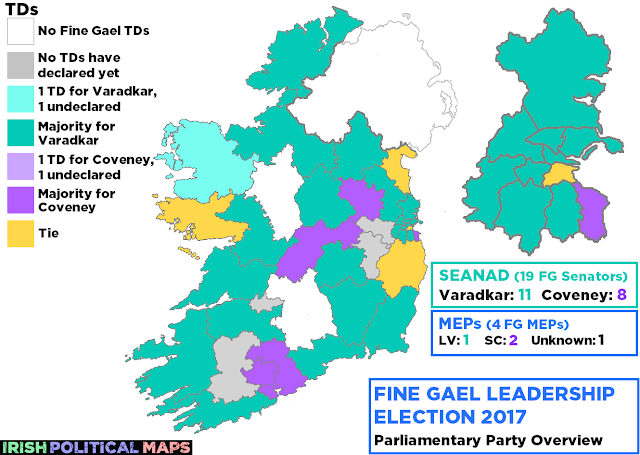 With high profile figures such as Tánaiste and Justice Minister Frances Fitzgerald and Foreign Affairs Minister Charlie Flanagan in his camp, it looks inevitable that Leo Varadkar will emerge successful, but Minister Coveney is not throwing in the towel yet. The parliamentary party has only a 65% say in who the next leader will be. 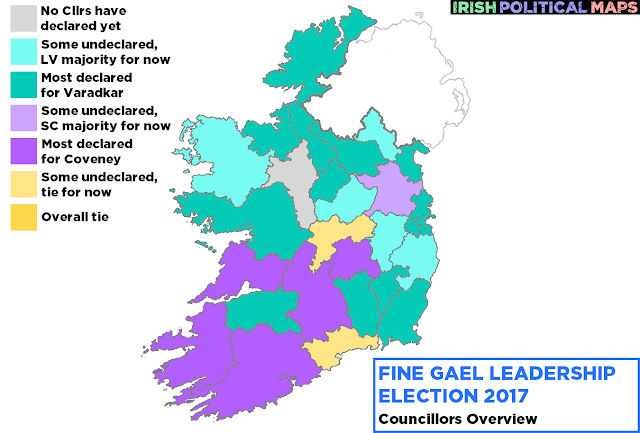 The party membership has a 25% say (and mapping their support before the event is not possible), while Fine Gael councillors have 10% say. 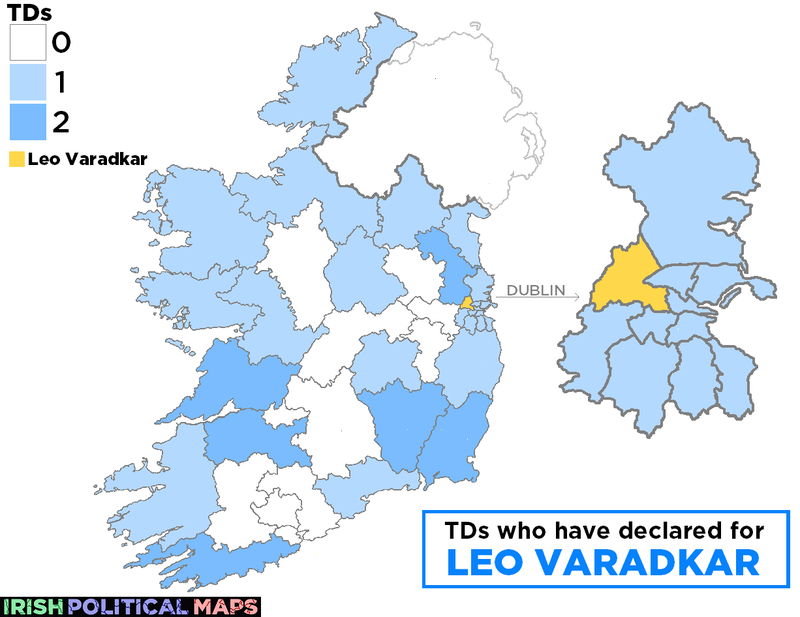 While it appears that the parliamentary party largely fell into line when it became clear the momentum was with Minister Varadkar, the support of councillors seems to come down to geography. 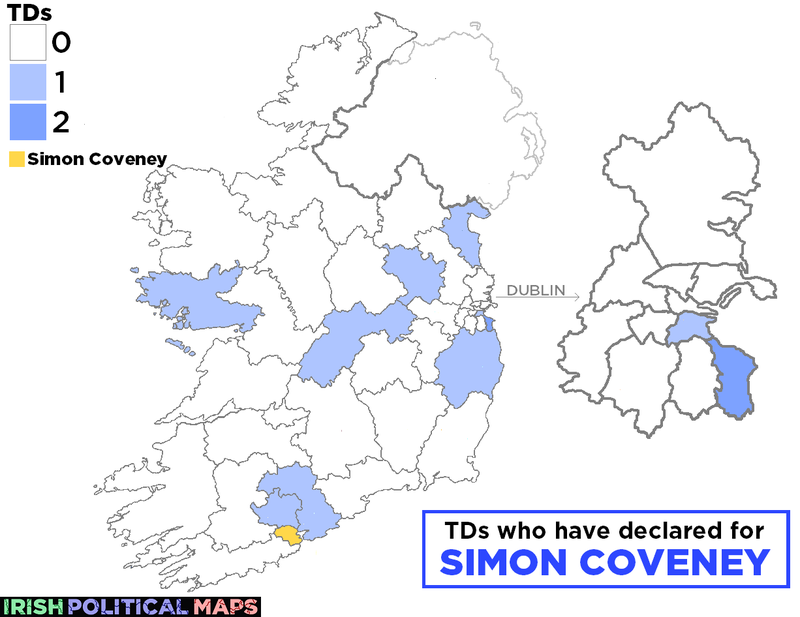 Coveney's support is understandably strongest in Munster - not only is he a Cork TD, he served as an MEP for Munster from 2004 to 2007. Cork County Council's Fine Gael members voted unanimously to support him. 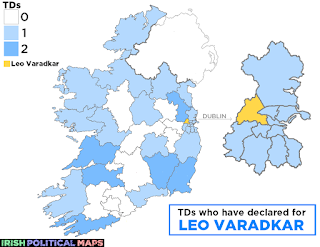 Limerick began to sway to the Varadkar camp over the weekend, after the surprise declaration of its TDs for the Social Protection Minister, who has a majority of support among the party's Dublin, Leinster, Connacht and Ulster councillors. Four councils are ties for now, while none of Roscommon's three Fine Gael councillors have declared for either candidate yet. 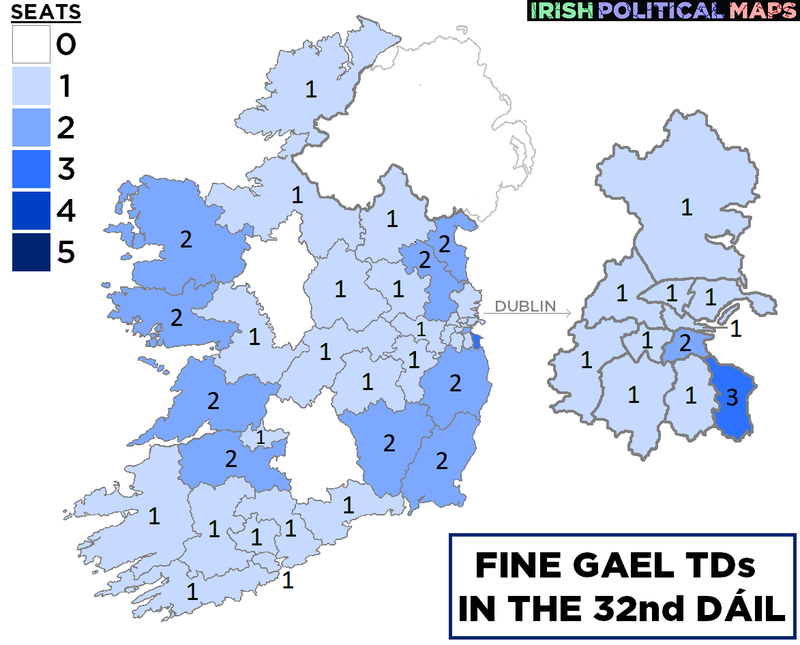 Only five Fine Gael TDs have not declared - it is unlikely that the outgoing Taoiseach Enda Kenny (Mayo), and the party chair Martin Heydon (Kildare South) will declare publicly due to their positions, while outgoing Finance Minister Michael Noonan has been rumoured to be in support of Coveney. That leaves Agriculture Minister Michael Creed (Cork North West) and Bernard Durkan (Kildare North).